Did you know that The York & District Society of Model Engineers used to have its home behind Bishopthorpe Working Men’s Club? Back in 1948, the Society was searching for somewhere to set up track to run its engines. In March 1949 the Society learned of an available site behind the Club in Main Street. Following successful negotiations, the Modellers acquired the use of this land, an orchard, for an annual rent of 3GBP. The track was quickly laid in May and June and running was commenced in time for the Society’s twentieth anniversary. The site was vacated in 1966 when the land was sold for development. 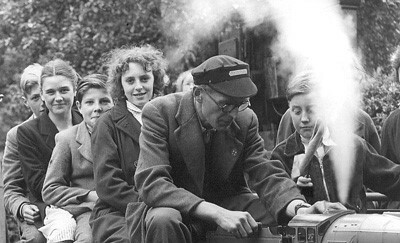 The photograph, taken c1954, shows driver Bill Shearman giving village children a ride. The locomotive is a model of a London & North Eastern Railway V2 named ‘Old Alf’. Can anyone provide further information about the event? Go to ‘Contact’.